I speak with educators frequently about not starting from a blank slate. As teachers and administrators, you are so busy that recreating the wheel is not a productive use of your time. You should consider checking out what resources are out there before you begin writing curriculum, preparing for a presentation, or designing a unit of instruction. This is not an original concept. But so many of us worked in isolation, behind the closed doors of our classrooms for so many years, that it doesn't come naturally to us to reach out to others for assistance. It has just been recently that so many of us have join in on Social Bookmarking, Nings and other methods of sharing resources with each other. 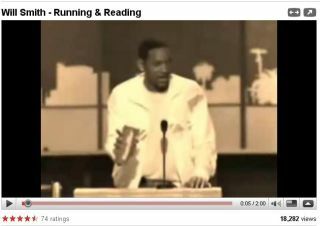 Will Smith says in this video "There's no new problem you can have with your parents, with school, with a bully, with anything. There's no problem you can have that someone hasn't already solved and wrote about it in a book." On Tuesday, I was listening to a middle school math teacher introduce exponents to her class. She spoke with them about the Twilight book series and the upcoming movie release. The students used their calculators to figure out how many people would become affected should one person in the class be bit by a vampire. I was impressed at how engaged they were and the teacher really made a great decision as to her choice of pop-culture connection to meet her objective. Friday morning I taught a podcasting workshop and would you believe it, the theme of exponents came up again as the enthusiasm exploded for just how many students and families this type of technology would be able to help int he district. Will said "the person that works the hardest wins". He also said that the two keys to life were running and reading. If you haven't watched the video yet, please take ninety seconds to watch it and then go read these books.